When I think I can’t stretch my craft and art supplies any further, I find myself playing and creating fun new things I had not thought of before! 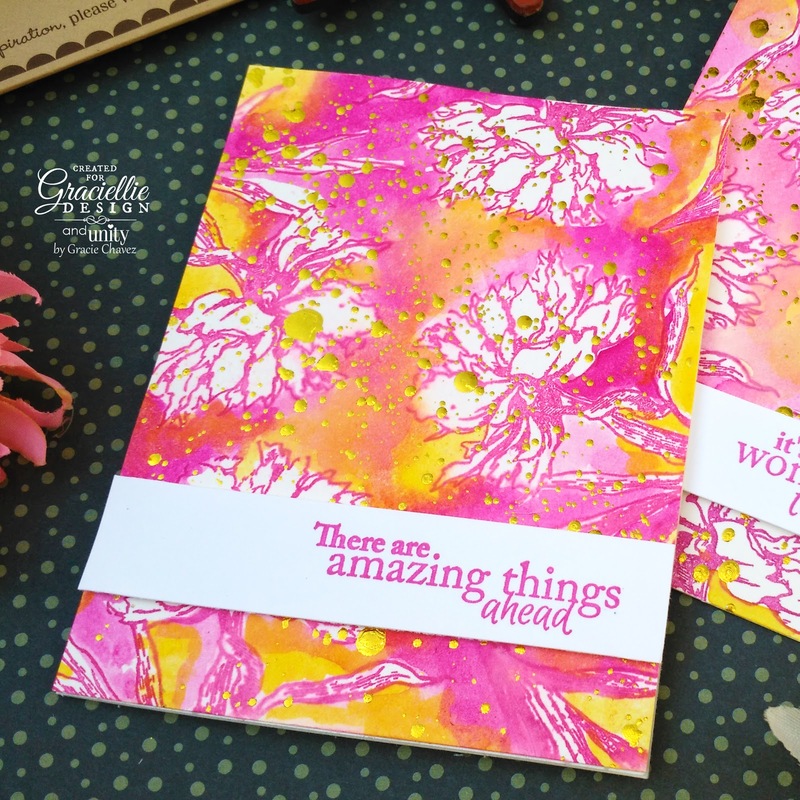 Today I’m sharing a mini video tutorial with quick tips on how to create this negative watercolored background with yummy, detailed splattered foil! This card might as well be one of my favorites… I just enjoy painting backgrounds so much and I love the negative watercoloring using these two colors! 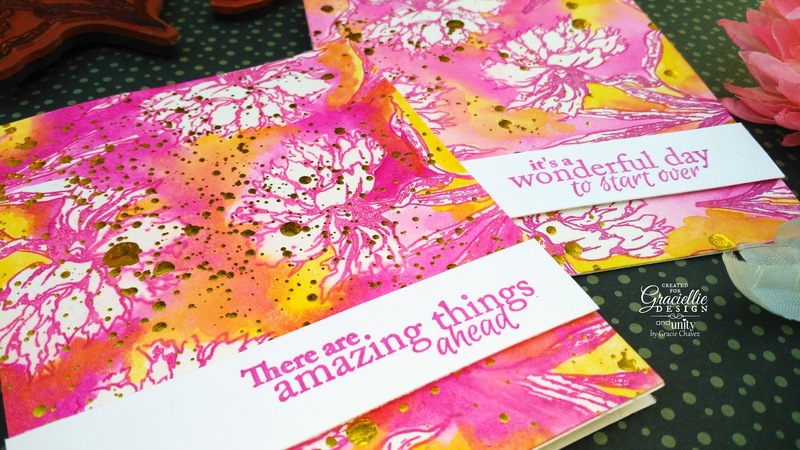 Such an inspirational stamp set surely needs a colorful canvas to complete its sentiments! I’m not sure how the foil splatter came about… This watercolored background was very instinctive and it was such a natural process for me. I usually like to splatter watercolor to add an organic touch to my watercolor washes so I guess somehow I thought splattering foil would work -and it did. I love how that yellow foil matches the Gamboge Yellow on the background and at the same time breaks the monotony of what would have been a simple watercolor wash adding texture and glimmer! If you love this kit you might as well want to check out the entire new rubber stamp collection by Graciellie Design for Unity Stamp Company. 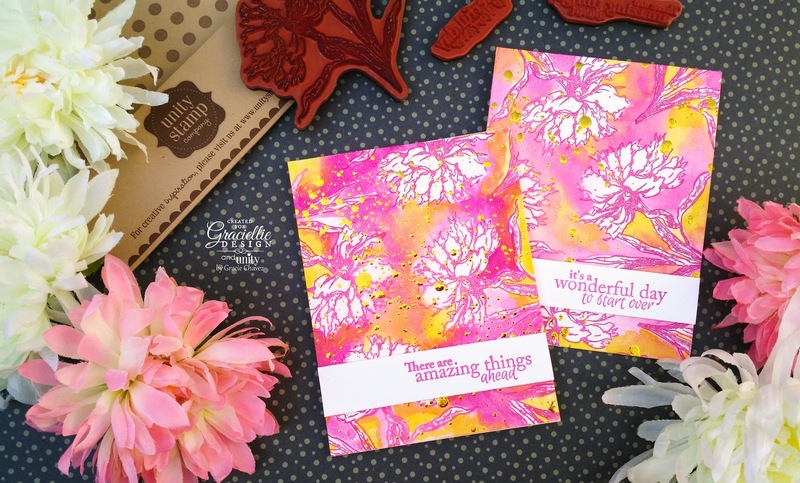 Today’s stamp set is called Amazing Things, and it’s one of my favorites! 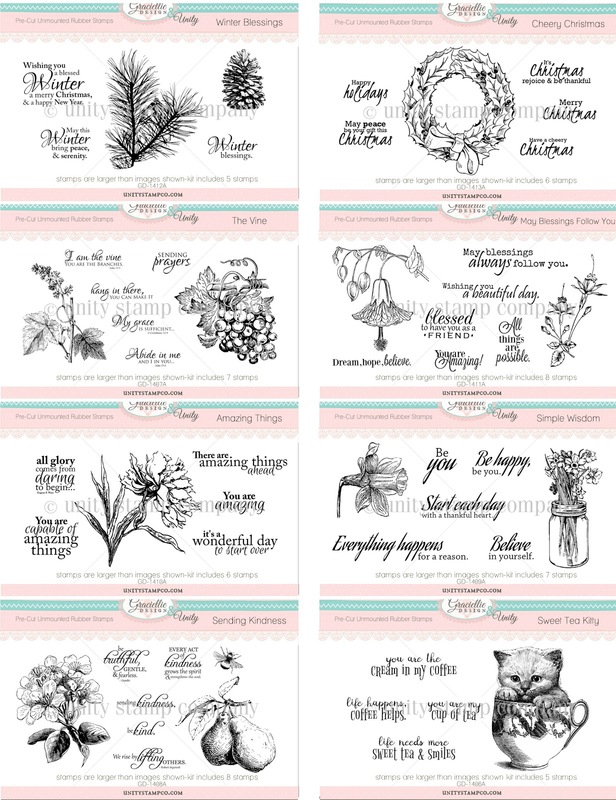 There so many different styles of stamps in this release, from cute to vintage, for Fall and Christmas, and there are lots of florals in it (which is just the way I like it)! Find them all HERE. We have more project ideas to share, meaning the design team and I. They have prepared wonderful blog posts and short tutorials that you might enjoy! Thanks to everyone who joined our giveaways this month, from our new release blog hop to our World Cardmaking Day Celebration on social media. The winners of a 3 pack of new Unity Stamp Company kits by Graciellie Design are: Purple Princess, Joyce Erb and Teresa Godines. Congratulations! Please send me a message through this blog’s contact form with your info so Unity can send your prize! To those who are new to my YouTube channel, I will be giving away a special gift one of our new subscribers who not just subscribe, but also like, comment and share this new tutorial starting today up until the end of October! (Make sure to do that under today’s video.) I will be announcing the winner during our very special November new release blog hop! Stay tuned. 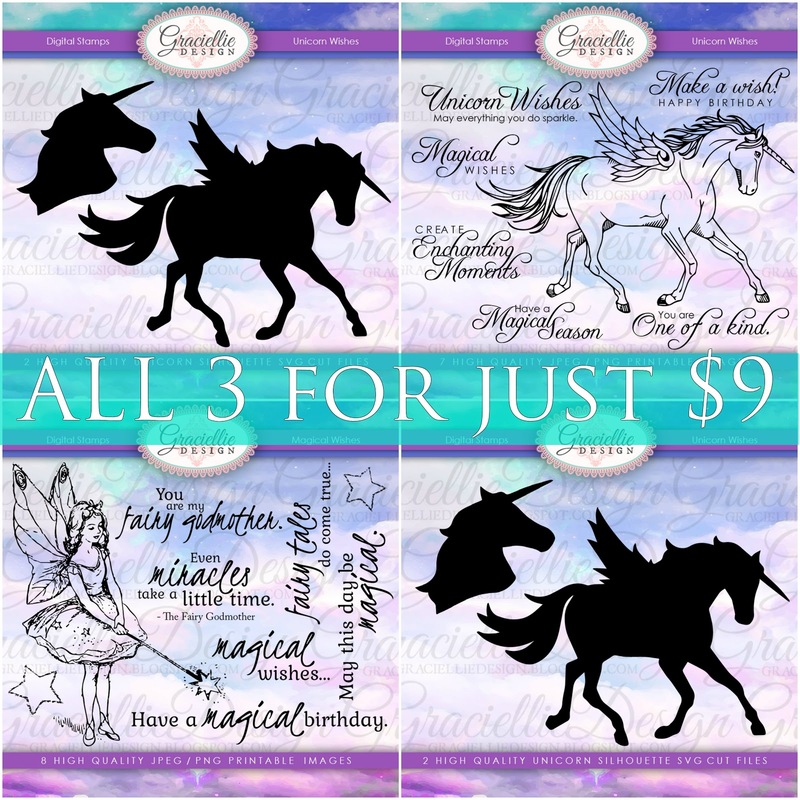 Get our new Magical Collection for only $9. This bundle will be available for a very limited time so make sure to get it soon! That’s all for now. Hope you have a creative week! Remember to tag us on social media #gracielliedesign, @gracielliedesign, #digitalstamps so we see what you have created with our new and not so new stamps! You can find us on Facebook, Instagram and Twitter. Until next time! 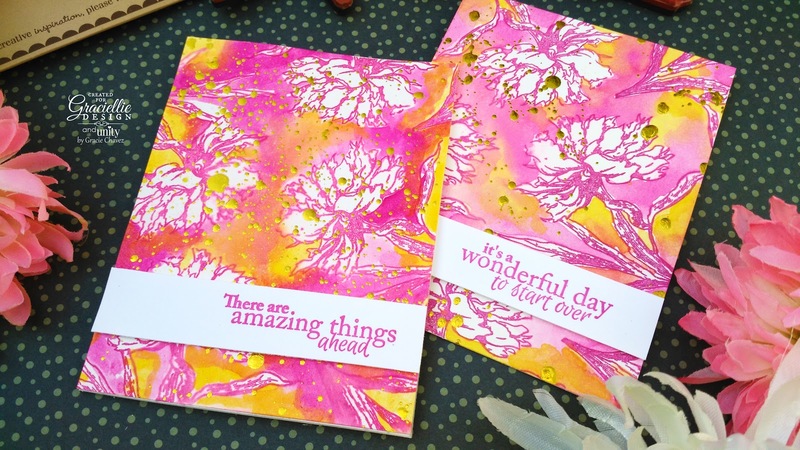 Beautiful cards & fun technique! Beautiful cards, Gracie. You are so talented. Stunning work as usual, Gracie. You have a flair for bold and colorful! Congratulations to the winners! Oh my gosh !! How gorgeous is these cards ! !